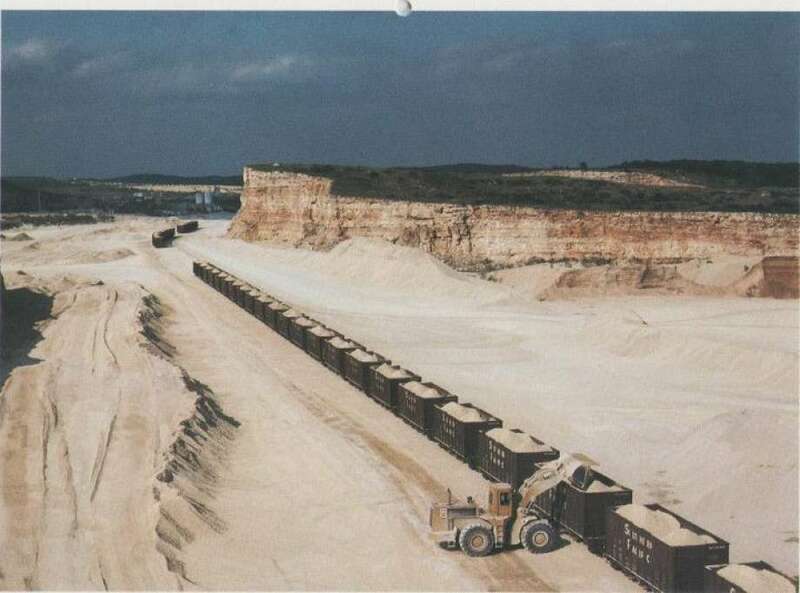 The limestone quarry, which was created in 1934, is mined out for future development. This is the spot where Fiesta Texas will be constructed. A development team consisting of USAA and Gaylord Entertainment Company begin early stages of planning for the theme park. The striving Seaworld San Antonio park, which opened in 1988, and the fact that San Antonio is a stable vacation destination, push the park development plans forward. The 23-month schedule of construction on Fiesta Texas officially breaks ground. Fiesta Texas opening season commercial. 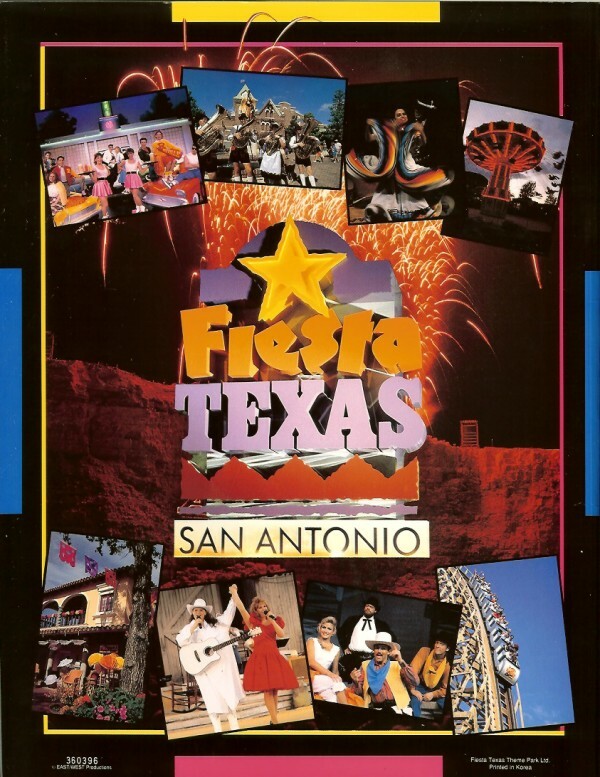 Fiesta Texas officially opens on March 14, 1992. The park features four themed areas and a waterpark. The four areas include Crackaxle Canyon, Los Festivales, Rockville, and Spassburg. The water park is named Ol' Waterin' Hole. Being primarily a show-inclined park, the only major roller coaster in operation is The Rattler. 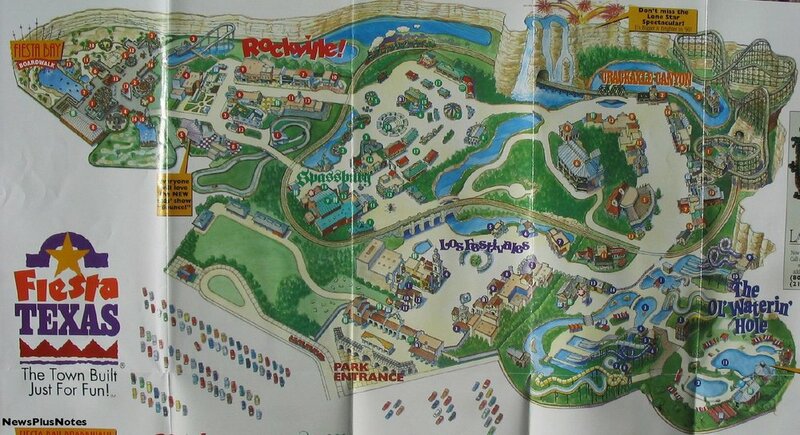 Other major attractions that opened during the 1992 season include: The Gully Washer, Whistle Stop train station, Steingasse, Die Fledermaus, Pied Piper, Kinderbahn, Dornroschen, Hustler, Power Surge, Rennsporplatz, Der Fliegenzirkus, Kinderwagen, and Motorama Turnpike. The Ol' Waterin' Hole includes these water attractions: Texas Tumble, White Water Canyon, The Six Chuter, The Mine Shaft, Blow Out, Twister, The Gusher, Pipeline, The Triple Dipper, and Splashwater Springs. The season officially ends on October 31st, 1992. Major construction begins on the park's sixth area, Fiesta Bay Boardwalk. The S.S. Overboard on Fiesta Bay Boardwalk. Fiesta Bay Boardwalk officially opens for the 1994 season. Attractions include: Crow's Nest, Wave Runner, Cap'n Willie's Shrimpboat, Bayside Paddle Boats, Seaside Golf, The Wipeout, S.S. Overboard, and Little Castaways. A one-day ticket to Fiesta Texas costs $24.95. The park extends their operating season into December for an event called, "A Lone Star Christmas." Screamin' Skycoaster is added to the Fiesta Bay Boardwalk section of the park. Fiesta Texas leads into their second season of the event, "A Lone Star Christmas" during the month of December. Time Warner takes over management of Fiesta Texas, changing the name to Six Flags Fiesta Texas. USAA still remains the sole owner of the theme park. Joker's Revenge, a Vekoma Hurricane Coaster, is added to the Fiesta Bay Boardwalk section of the park. Wagon Wheel, a Schwartzkopf Enterprise, is added to the Crackaxle Canyon section of the park. 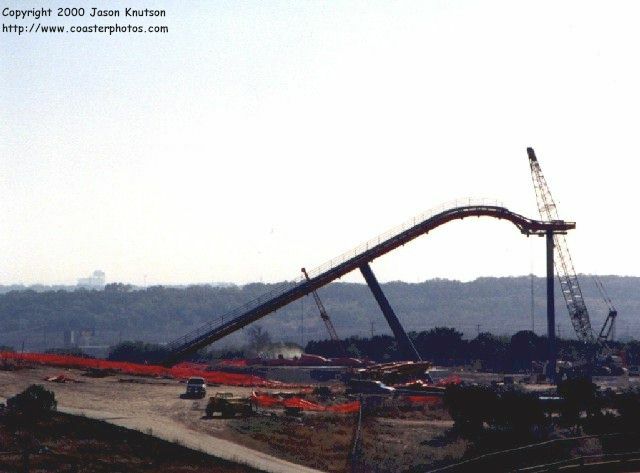 This ride is relocated from Six Flags Over Texas. The Ol' Waterin' Hole adds these water attractions: Tadpole Pond, Sandy Bottoms, Ol' Swimmin' Hole, and Crackaxle Springs. "A Lone Star Christmas" is given the new name, Holiday in the Park, and runs through December. Road Runner Express in Crackaxle Canyon. Road Runner Express, an Arrow Mine Train, is added to the Crackaxle Canyon section of the park. "Holiday in the Park" discontinues after the 1997 season. Rennsporplatz is removed from the Spassburg section of the park after the 1997 season. Before the season begins, Cap'n Willie's Shrimpboat, Bayside Paddle Boats (Fiesta Bay Boardwalk), and Seaside Golf (Rockville) are removed from the park. Premier Parks purchases Six Flags in 1998. Premier also purchases Six Flags Fiesta Texas from USAA. Bugs' White Water Rapids, a Hopkins Log Flume ride, opens in the Spassburg section of the park. Der Twister, a Huss Top Spin, opens in the Spassburg section of the park. Frisbee, a Huss Frisbee, opens in the Los Festivales section of the park. Tadpole Pond and Sandy Bottoms are removed from the water park. 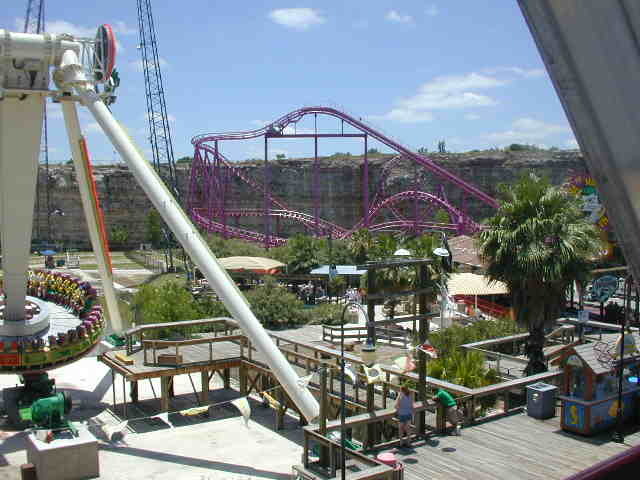 In 1999, Six Flags Fiesta Texas goes through a huge expansion, which includes over ten ride additions to the main park and new additions to the water park. The Los Festivales area adds Boomerang, a Vekoma Boomerang coaster, which opens on March 13, 1999. Crackaxle Canyon adds new kiddie attractions Daffy's Duckaneer, Foghorn Leghorn's Barnyard Railway, and Yosemite Sam's Wacky Wagons. The Spassburg area adds Kinderstein, a Zamperla Mini Tea Cups attraction. 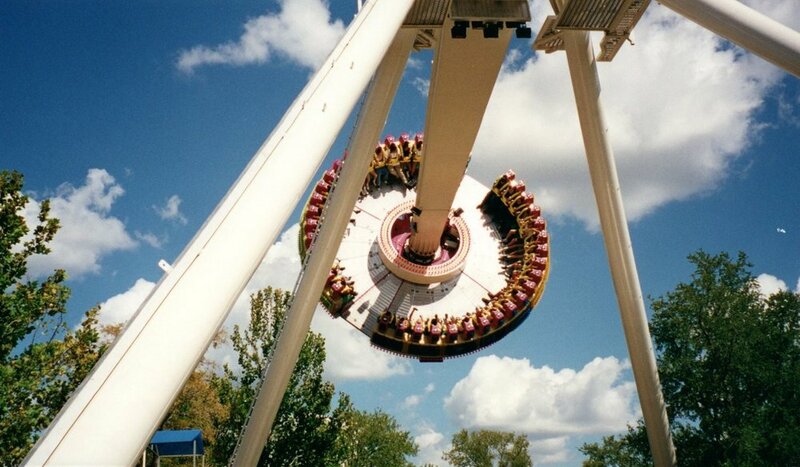 The Rockville area adds Daffy's School Bus Express, Taz's Tornado, Chaos, Scream, an S&S Combo Complex (two towers open on March 13 while the third tower opens later in the season), and Poltergeist, a Premier Rides LIM coaster, which opens on May 28, 1999. The water park is renamed Armadillo Beach and adds the Lone Star Lagoon and Texas Treehouse attractions. Frisbee is relocated to the Fiesta Bay Boardwalk section of the park. Pied Piper is renamed Rollschuhcoaster. Season passes for the 1999 season start at $39.99. Six Flags Fiesta Texas wins the Golden Ticket award for "Best Theme Park Shows." The Gusher and Pipeline are removed from the water park. On March 11, 2000, Superman Krypton Coaster, a B&M Floorless coaster, opens in the Spassburg area of the park. The park has plans of building a brand new family coaster called the Boardwalk Canyon Blaster but these plans never take place. The ride is eventually sold to Warner Bros. Movie World. Daffy's Duckaneer is removed from the park. Turbo Bungy, a Eurobungy attraction, is added to the Crackaxle Canyon section of the park. Screamin' Skycoaster is removed from the Fiesta Bay Boardwalk section of the park. Tempest, a Gravity Works Skyscraper attraction, is added to the Fiesta Bay Boardwalk area of the park. Scooby-Doo Ghostblasters, a Sally Dark Ride attraction, is added to the Fiesta Bay Boardwalk area of the park. The Rattler undergoes major retracking. Joker's Revenge does not operate for the 2002 season. Poltergeist receives a lapbar/seatbelt restraint system and removes the over-the-shoulder restraints. The Triple Dipper is removed from Armadillo Beach. 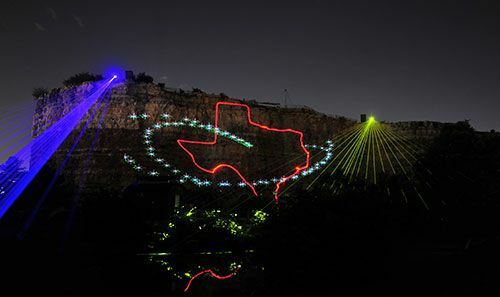 The Lone Star Spectacular featured fireworks and laser effects. Joker's Revenge is removed from the Fiesta Bay Boardwalk section of the park and is relocated to Six Flags New Orleans. 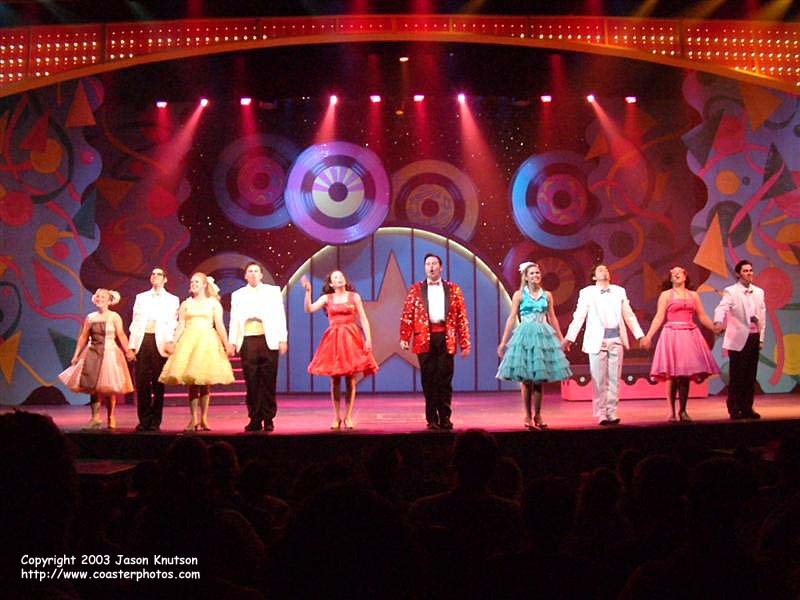 The Lone Star Spectacular premieres during the summer months. The Wipeout, an attraction on the Fiesta Bay Boardwalk, ceases operation after the 2003 season. Six Flags Fiesta Texas wins the Golden Ticket award for "Best Floorless Roller Coaster." A look at Tornado during the 2018 season. Tornado, a water slide attraction, is added to the Armadillo Beach section of the park. Chaos is removed from the Rockville section of the park. Turbo Bungy is removed from the Crackaxle Canyon section of the park. Crackaxle Springs and Ol' Swimmin' Hole are removed from the Armadillo Beach water park. Big Bender and Whirlpool were added to White Water Bay in 2006. Armadillo Beach is renamed White Water Bay and the water park undergoes a large expansion. 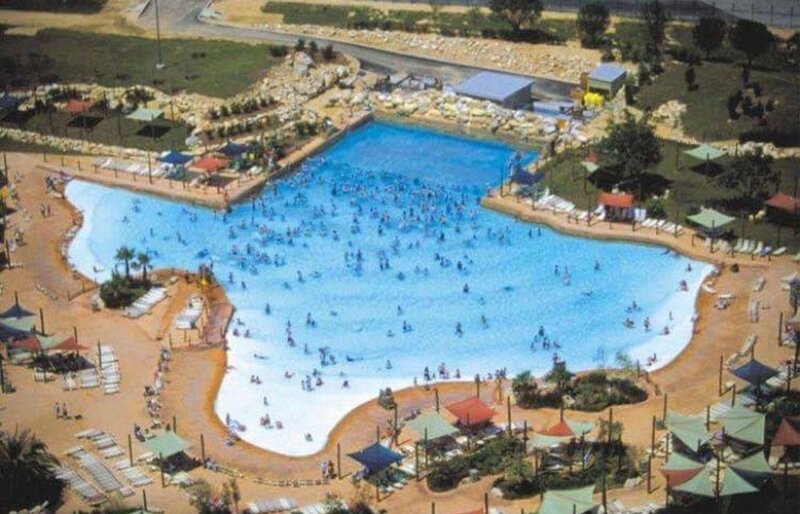 New water park attractions include Whirlpool, Big Bender, Hill Country Racer (former AstroWorld attraction) and a revamped Splash Water Springs. The Wipeout and Tempest are removed from the Fiesta Bay Boardwalk section of the park. Holiday in the Park returned to Fiesta Texas in 2007. Tony Hawk's Big Spin, a Gerstlauer Spinning Coaster, opens on March 10, 2007 in the Fiesta Bay Boardwalk section of the park. Holiday in the Park, a holiday event spanning in the winter months, returns to the park. Dornroschen prior to being moved to Rockville. Goliath, a B&M Inverted Coaster, opens on April 18, 2008 in the Los Festivales section of the park. Dornroschen is moved to the park's Rockville section and renamed Amerigoround. This move is made for the addition of Wiggles World in 2009. Der Fliegenzirkus and Kinderwagen are removed after the 2008 season from the Spassburg section of the park. Frosty's Snow Chutes, a snow hill attraction, is added for Holiday in the Park. Six Flags Fiesta Texas wins the Golden Ticket award for "Best Theme Park Shows" for the tenth year in a row. 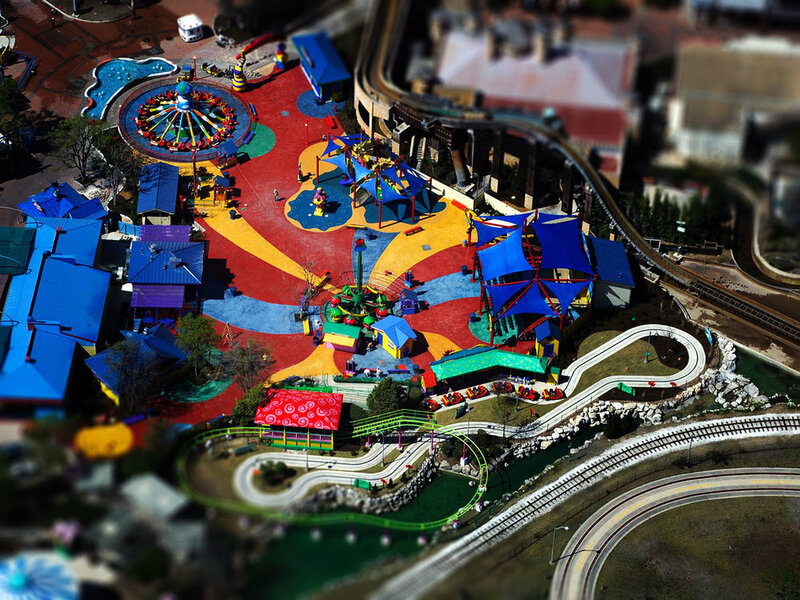 An aerial view of Wiggles World. Wiggles World officially opens for the 2009 season which features many re-themed attractions from the Spassburg kid's area and also includes these new attractions: Splish Splash Zone, Yummy Yummy Fruit Salad, and The Big Red Planes. Attractions already located in this section of the park are renamed and rethemed. Rollschuhcoaster is renamed Romp Bomp a Stomp and Kinderbahn is renamed The Big Red Cars. Lil' Bronco Buster is moved from Crackaxle Canyon to Wiggles World and renamed The Wiggly Trail. In Spassburg, Die Fledermaus is renamed Whirligig, Steingasse is renamed Fender Bender, and Der Twister is renamed The Twister. Frosty's Snow Chutes does not come back after the 2010 Holiday in the Park event. The former signage of Tony Hawk's Big Spin. Six Flags, Inc. ends licensing contracts with both Tony Hawk and The Wiggles. Tony Hawk's Big Spin is renamed Pandemonium. Wiggles World is renamed Kidzopolis. Romp Bomp a Stomp is renamed Kiddee Koaster. The Wiggly Trail is renamed Buckarooz. The Big Red Cars is renamed Krazy Kars. Yummy Yummy Fruit Salad is renamed Up, Up & Away. The Big Red Planes is renamed ZoomJets. Wagon Wheel is removed from the Crackaxle Canyon section of the park. A look at SkyScreamer in action. SkyScreamer, a Funtime Star Flyer attraction, opens in the Spassburg section of the park. S.S. Overboard ceases normal operation after the 2012 season. The Rattler is closed during the season in preparation for construction to become the Iron Rattler. Texas Gunslinger, a Funtime Slingshot attraction is added to the Crackaxle Canyon section of the park where Wagon Wheel once stood. The Rattler is reintroduced as Iron Rattler after undergoing major reconstruction into a hybrid coaster during 2012 and the off-season. 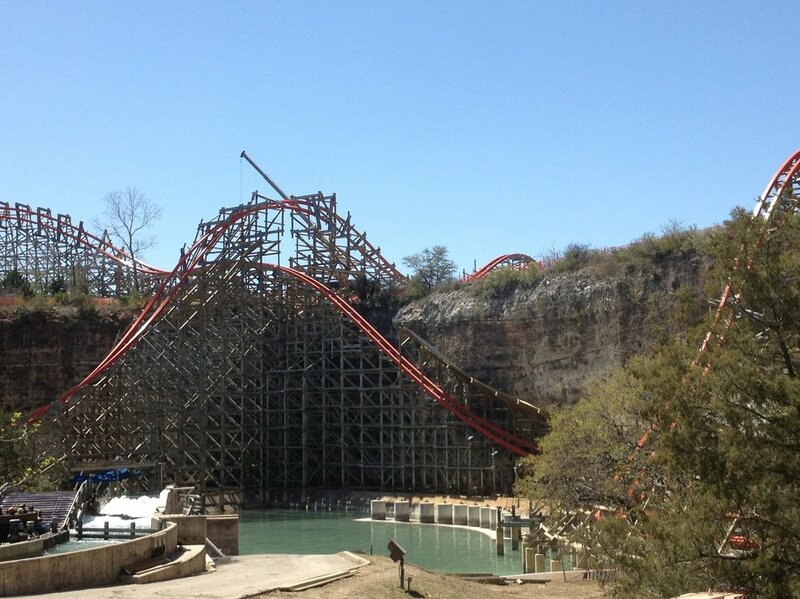 Iron Rattler officially opens on May 25. The Bahama Blaster and Bamboo Chutes water attractions are added to the White Water Bay water park. Motorama Turnpike is removed from the Rockville section of the park to make way for Batman: The Ride in 2015. Batman: The Ride is the first of its kind in the world. Batman: The Ride, a S&S 4D Free Spin Coaster, is added to the Rockville section of the park and officially opens on May 3, 2015. The summer show line-up includes Ovation in Zaragoza Theatre, #iPop in Teatro Fiesta, Vinyl Countdown in Rockville High School Theatre, and the Lone Star Spectacular to end each night. The Fright Fest show line-up includes Skeleton Krew in Teatro Fiesta, Creature Feature in Zaragoza Theatre, Rock Apocalypse in Sundance Theatre, and Monster Mash Bash in Lone Star Lil's Amphitheater. The Holiday in the Park show line-up includes Majesty of Christmas in Zaragoza Theatre, My Christmas Card to You in Rockville High School Theatre, and The Tinseltones outside of Rockville High School Theatre. S.S Overboard, Little Castaways, and Frisbee are removed from the Fiesta Bay Boardwalk section of the park. Monster Mash Bash featured a post-apocalyptic storyline in 2006. The 2016 season begins on February 27. Daily tickets are $63.99, season passes are $75.99, and daily parking is $20. Fiesta Bay Boardwalk's boardwalk is completely refurbished with new wood. All boardwalk buildings and some attractions are repainted. New LED lighting features are added throughout the area. Fireball, a Larson Super Loop, Hurricane Force 5, a Zamperla Disk'O, and Spinsanity, a Larson Tilt-a-Whirl open in the Fiesta Bay Boardwalk section of the park. The summer show line-up includes #iPop in Teatro Fiesta, From Memphis to Motown at Sangerfest Halle Stage, Vinyl Countdown in Zaragoza Theatre, and the Lone Star Spectacular at the end of each night. Fright Fest operates from September 24 through October 31. The show line-up includes Skeleton Krew in Teatro Fiesta, Dead Man's Party in Zaragoza Theatre, Rock Apocalypse in Sundance Theatre, and Monster Mash Bash in Lone Star Lil's Amphitheater. The event features five scare zones and five haunted houses. Haunted houses are free for the first time ever but the park still provides upgrade options. Holiday in the Park operates from November 19 through January 2. The show line-up includes Majesty of Christmas in Zaragoza Theatre, My Christmas Card to You in Rockville High School, The Tinseltones at Rockville Christmas Tree Stage, and Have Yourself a Looney Tunes Christmas at Sangerfest Halle Stage. The park also adds two new entertainment features including North Pole Reflections, a building projection show, and Holiday Illuminations, a Christmas light show added to the Rockville Christmas tree. 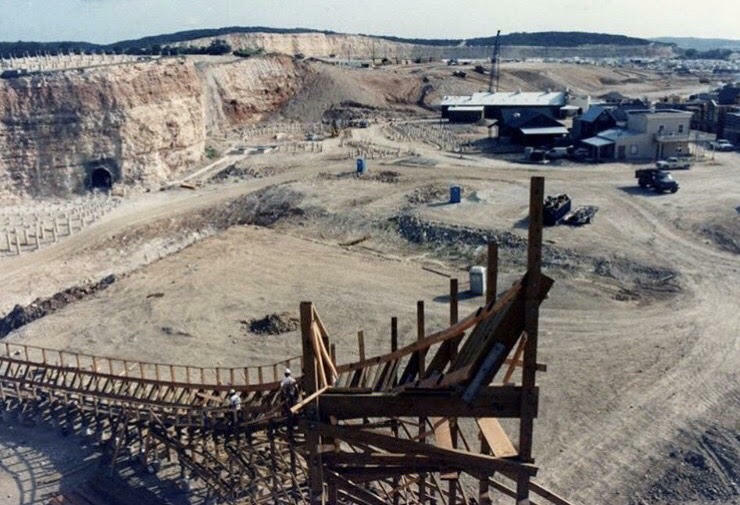 Demolition of Hill Country Racer, a six-lane water slide, begins in December to make way for the new 2017 Thunder Rapids attraction. The 2016 season ends on January 2, 2017. Fiesta Texas was one of the first parks to host Mardi Gras Festival. The 2017 season begins on February 25. Thunder Rapids Water Coaster, a Proslide RocketBLAST Water Coaster, is added to White Water Bay. This is the first installation of this ride model in North America. The ride opened to the general public on June 3 with soft openings from May 27 through 29. The spring/summer show line-up includes V!BE in Teatro Fiesta (new for 2017), From Memphis to Motown at Sangerfest Halle Stage, The Vinyl Countdown: Volume II in Zaragoza Theatre (new for 2017), and Celebrate!, a new fireworks/special effects production. A Mardi Gras Festival featuring a parade, specialized food, and other entertainment operates in the park from March 24 through April 30. White Water Bay opens for the season on April 29. Four water slides are repainted and renamed in White Water Bay. Mine Shaft is renamed Bermuda Triangle, Blowout is renamed Paradise Plunge, Six Chuter is renamed Riptide Runner, and Twister is renamed Typhoon Twister. Drop of Doom, a virtual reality ride feature, is added to the Scream attraction from July 15 through August 21. Major repainting of food and shop structures takes place throughout the whole season, mostly impacting Crackaxle Canyon and Los Festivales. On July 23, Power Surge (Intamin Shoot the Chute), one of the park's original water ride attractions, closes permanently. In early August it is announced that Wonder Woman Golden Lasso Coaster will be coming to Rockville in Spring of 2018, replacing Power Surge. White Water Bay closes for the season on September 10. A new table service restaurant, Thirsty Buffalo Saloon, opens in Crackaxle Canyon just before Fright Fest begins. Fright Fest starts on September 15, which is the earliest start time for the festival in park history. Live shows include Monster Mash Bash in Lone Star Lil's Amphitheater, Dead Man's Party in Zaragoza Theatre, Rock Apocalypse in Sundance Theatre, and Monster Boogie (new for 2017) in Teatro Fiesta. Fright Fest also offers six haunted houses and five scare zones. The event ends on October 31. In October, construction begins moving quickly on Wonder Woman Golden Lasso Coaster and coaster pieces arrive on-site. In November, Amerigoround is removed from Rockville for refurbishment and relocation for the 2018 season. Holiday in the Park starts on November 18. Live shows include The Tinseltones in Rockville, My Christmas Card to You in Rockville High School, Have Yourself a Looney Tunes Christmas at Sangerfest Halle Stage, and Majesty of Christmas in Zaragoza Theatre. New event attractions include Santa's Cottage, Winter Wonderland, and Hometown Holidays. The event ends on January 7. In December, the park announces that Scooby-Doo Ghostblasters will close at the end of the season. A new dark ride will take its place for 2018. The ride officially closes on January 7, 2018. The 2017 season ends on January 7, 2018. Wonder Woman Golden Lasso Coaster is the first-ever RMC Raptor coaster in the world. The 2018 season begins on February 25. During the off-season, Goliath, Tornado (White Water Bay), and Taz's Tornado receive brand new paint jobs. Kinderstein, the park's mini tea cups attraction, is refurbished during the off-season. The former Cold Stone Limited location becomes Funnel-Liscious, a new funnel cakes stand. Blue Snowman Ice Cream, serving Dole Fruit Swirl products, takes over the former location of Reggie's Funnel Cakes in Rockville. Cocktails on the Corner, a new full-service bar, is added to Primo's Pizzeria in Rockville. Wonder Woman Gifts, a brand new gift shop, is added to Rockville. The Der Pilger Bahnhof train station is given a theme refresh and is repainted yellow, brown, and turquoise. Daffy's School Bus Express is given a paint job during the spring. Mardi Gras Festival returns to the park from April 27 through May 28 and features all-new food options, nighttime parade, and an extended live entertainment line-up. Wonder Woman Golden Lasso Coaster officially opens to the general public on May 12, 2018 with soft openings beginning on April 27. The park's spring/summer show line-up includes ¡Bailando! and V!BE in Teatro Fiesta, Vinyl Countdown: Volume II in Zaragoza Theatre, and the all-new Totally Rockville in Rockville High School. The Celebrate! Summer Night Spectacular returns and runs through the summer months. July 4th Fest takes place from June 30 through July 4 and features a food festival, nightly patriotic fireworks display, and foam after party. Grand Carousel (formerly known as Amerigoround) is reinstalled in the park's Spassburg section. The ride officially reopens on July 18. On August 26, it is announced that The Twister will not operate for the remainder of 2018. On August 30, the park announces that The Joker Wild Card, a Zamperla Giant Discovery, will be added to the park's 2019 ride line-up. The park also announces the addition of DC Universe for the 2019 season. This new park area will take over parts of Rockville and Spassburg. Fright Fest operates from September 14 through October 31. The entertainment line-up includes the all-new House of Bones in Zaragoza Theatre, Monster Mash Bash in Lone Star Lil's Amphitheater, Rock Apocalypse in Sundance Theatre, Monster Boogie in Teatro Fiesta, and The Awakening. A new haunted house, Midnight Museum of the Macabre, is introduced in the Spassburg section. A new scare zone, Soul Harvest, is introduced in the park's Los Festivales section. The event provides a total of six haunted houses and five scare zones. In October, a new gift shop named Simply Southern opens in the park’s Spassburg section. Panda Express permanently closes at the end of Fright Fest. The Twister is demolished and removed from the park in November. Holiday in the Park operates from November 17 through January 6. The entertainment line-up includes the brand new The Heart of the Holidays show in Rockville High School, The Majesty of Christmas in Zaragoza Theatre, The Tinseltones in Rockville, and Have Yourself a Looney Tunes Christmas at Sangerfest Halle Stage. Pirates of the Deep Sea is one of multiple new attractions coming in 2019. Six Flags Fiesta Texas begins year-round operation in 2019. Pirates of the Deep Sea, a brand new dark ride attraction taking over the former Scooby-Doo Ghostblasters location, opens on January 12. Soft openings take place from January 1 through 6. In January, the Kettle Corn and The Hop food stands are removed. Jelly Belly, a shop on Fiesta Bay Boardwalk, is also removed. Mardi Gras Festival operates from January 19 to March 3 and includes a daily parade, decor, and specialty food items. The entertainment line-up includes The Big Easy Duo at Sangerfest Halle Stage, the Dixieland Jazz Celebration at Texas State Square Stage, and The King William Brass Band at the Rockville Outdoor Stage. In February, it is announced that The Joker Wild Card, a new attraction coming for 2019, will be renamed The Joker Carnival of Chaos. 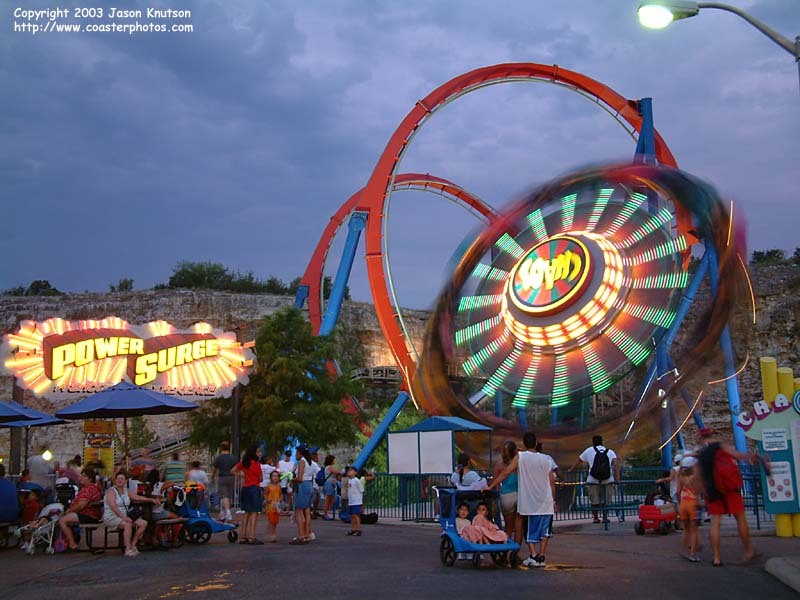 Fiesta Texas also announces that Whirligig will return as DC Super-Villain Swing. In March, Coaster Candy, a new candy shop, opens and takes over the former location of Spitze's Sweets in Spassburg. After closing for extensive refurbishment in February, Hustler reopens to the public on April 13. Knutson, Jason. Coasterphotos.com. coasterphotos.com. Accessed 7 Sept. 2016.